This notable home was demolished in 1970 yet is still considered one of the 10 best homes in Los Angeles. 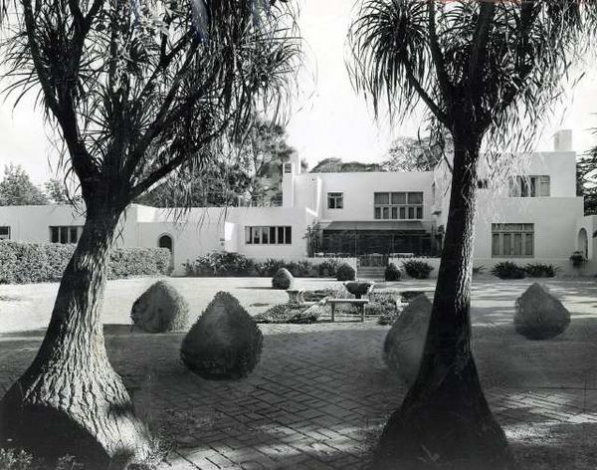 The home is famous for being one of the earliest examples of modernism, being built between 1914 – 1916, anticipating the architectual trends that would emerge after WWII. The home was designed by Irving Gill for Luther Dodge, the maker of a patent medicine that treated tired feet. The home is completely devoided of ornament in a mixture of mission and modernism. The home had avant-garde features such as a garbage disposal, central vacuum, a car wash, pocket doors, invisible hinges and brightly lit rooms from skylights and windows. Formally at 950 N. Kings Road, West Hollywood. This entry was posted on Thursday, November 18th, 2010 at 6:17 pm	and is filed under architecture & design. You can follow any responses to this entry through the RSS 2.0 feed.